Israeli tactical victories but overall strategic failure. After the 1948 Arab-Israeli war, Lebanon became home to more than 110,000 Palestinian refugees, after their settlements in Palestine and Israel had been depopulated as a result of the war. After its founding in 1964 and the radicalization among Palestinians, which followed the Six-Day War, the PLO became a powerful force, then centred in Jordan. The large influx of Palestinians from Jordan after the Black September conflict caused an additional demographic imbalance within Lebanese society and its democratic institutions established earlier by the National Pact. By 1975, the refugees numbered more than 300,000 and the PLO in effect created an unofficial state-within-a-state, particularly in Southern Lebanon, which then played an important role in the Lebanese Civil War. Prior to establishing ceasefire in July 1981, U.N. Secretary-General Kurt Waldheim noted: "After several weeks of relative quiet in the area, a new cycle of violence has begun and has, in the past week, steadily intensified." He further stated: "There have been heavy civilian casualties in Lebanon; there have been civilian casualties in Israel as well. I deeply deplore the extensive human suffering caused by these developments." The President of the U.N. Security Council, Ide Oumarou of Niger, expressed "deep concern at the extent of the loss of life and the scale of the destruction caused by the deplorable events that have been taking place for several days in Lebanon". Arafat pressured the radical factions to maintain the ceasefire because he did not wish to provoke the Israelis into an all-out attack. The PLO acceptance of the ceasefire had led to dissension even within Fatah itself. A faction sympathetic to Abu Nidal forced a military confrontation, with accompanying arrests and executions — an event unprecedented in PLO internal disputes'. Arafat even attempted to distance himself from Palestinian unrest on the West Bank to prevent an Israeli attack. In contrast, Begin, Sharon and Eitan were searching for any excuse to neutralize their military opponents through a breach of the ceasefire. They believed that Arafat was buying time to build up his conventional forces. The Israeli interpretation of the conditions for the ceasefire placed responsibility for any act of Palestinian violence on Arafat's shoulders. It presumed that Arafat had complete control, not only over all factions within the PLO such as the rejectionist Popular Front of George Habash, but also over those outside such as Abu Nidal's Fatah Revolutionary Council and Ahmed Jibril's Popular Front — General Command. Moreover, in Begin's eyes, the ceasefire was not geographically limited to the Lebanese border. He argued that if Palestinian terrorism struck internationally, then this too would be regarded as a breach of the ceasefire. Begin thus took a stand-off in a local battle as applying to the entire war anywhere in the Middle East or any incident internationally. Eitan commented that there was no difference if a terrorist threw a grenade in Gaza or fired a shell at a Northern settlement — all such acts broke the ceasefire. Sharon similarly did not wish to draw distinctions between different Palestinian factions, since all blame had to be attached to the PLO. He dismissed attempts at more rational evaluation as masking the real issue. In a speech to a Young Herut conference in April 1982, he accused those who tried to take a more objective standpoint of erecting 'a protective wall around the PLO inside and outside Israel'. According to Zeev Maoz in Defending the Holy Land: A Critical Analysis of Israel's National Security and Foreign Policy the goals of the war were primarily developed by then Minister of Defense Ariel Sharon and were fourfold: 1) "Destroy the PLO infrastructure in Lebanon, including the PLO headquarters in Beirut." 2) "Drive Syrian forces out of Lebanon." 3) "Install a Christian-dominated government in Lebanon, with Bashir Gemayel as President." 4) "Sign a peace treaty with the Lebanese government that would solidify the informal Israeli-Christian alliance and convert it into a binding agreement." George Ball testified before the U.S: Senate's Foreign Affairs Committee that Sharon's long-term strategy, as revealed in conversations, was one of "squeezing the Palestinians out of the West Bank . .allowing only enough of them to remain for work." On 3 June 1982 Israel's ambassador to the United Kingdom, Shlomo Argov was shot and seriously wounded in London by terrorists belonging to the Iraqi-backed Abu Nidal terrorist organization. The attack was ordered by the Iraqi Intelligence Service. Following the attack, the assassins drove to the Iraqi embassy in London, where they deposited the weapon. In his memoirs, Sharon stated that the attack was "merely the spark that lit the fuse". Israeli prime Minister Begin used this as the "internationally recognized provocation" necessary to invade Lebanon. The fact that the Abu Nidal organization was the longtime rival of PLO, that its head was condemned to death by the PLO court, and that the British police reported that PLO leaders were on the "hit list" of the attackers did not deter Begin. Iraq's motives for the assassination attempt may have been to punish Israel for its destruction of Iraq's nuclear reactor in June 1981, and to provoke a war in Lebanon that Iraqi leaders calculated would be detrimental to the rival Ba'ath regime in Syria—whether Syria intervened to help the PLO or not! On 4 June the Israeli cabinet authorized a large scale invasion. Begin referred to the operation as self-defense to "avoid another Treblinka". On 6 June 1982, Israeli forces under direction of Defense Minister Ariel Sharon launched a three-pronged invasion of southern Lebanon in "Operation Peace for Galilee". Roughly 60,000 troops and more than 800 tanks, heavily supported by aircraft, attack helicopters, artillery, and missile boats, crossed the Israel–Lebanon border in three areas. Simultaneously, Israeli armor, paratroopers, and naval commandos set sail in amphibious landing ships from Ashdod towards the Lebanese coast north of Sidon. Israel's publicly stated objective was to push PLO forces back 40 kilometers (25 mi) to the north. The advance along the coastal road was preceded by heavy artillery bombardment and airstrikes, but quickly became bogged down and was soon behind schedule. The narrowness of the road forced a slow advance, and Israeli armor became stuck in a large traffic jam. Several armored vehicles were knocked out by PLO fighters with anti-tank weaponry hiding in three groves along the road. One of the lead battalions, which was supposed to bypass Tyre and establish a blocking position to the north of the city, made a wrong turn and found itself in the center of the city, where it was ambushed. At eight in the evening the force finally crossed the Litani River and headed towards Sidon. In the central sector, the mission went as planned. The two Israeli divisions bypassed Beaufort Castle on both sides. Although an order to postpone the capture of Beaufort Castle was issued, it did not reach Israeli forces in time to prevent the operation, and Israeli troops of the Golani Brigade captured the castle in the fiercely-fought Battle of the Beaufort. The road junction at Nabatieh was also secured by the end of the first day. Meanwhile, the easternmost force penetrated into the Bekaa Valley and bore down on the Syrian positions. One division bypassed Mount Hermon via a road bulldozed by Israeli military engineers and cleared the town of Hasbaiya before swinging right and advancing towards Rachaiya. Though Israeli forces halted in the floor of the valley, they were flanking Syrian forces from the east and west. The Syrians put up minimal resistance and conducted some harassing artillery fire. By the end of the first day, the operation had gone almost entirely according to plan, though the advance along the coastal road was behind schedule. Despite the delays, the Israeli advance along the coastal road continued steadily. This advance was supported by heavy air attacks against PLO positions that included the use of cluster bombs. Israeli missile boats also employed 76mm cannons to destroy targets along the coast, firing 3,500 shells during ten days of fighting. Israeli armor continued to advance towards Sidon, while other Israeli infantry attacked the three Palestinian refugee camps in the area that were used as PLO bases: Rashidiya, Burj ash-Shamali, and al-Bass. The camps were all crisscrossed with networks of bunkers, trenches, and firing positions. The Israelis took each camp section by section using the same method: warnings were blared by loudspeaker urging civilians to leave, before air and artillery bombardment commenced, followed by an infantry assault. Israeli infantry had to engage in fierce urban combat in narrow streets. The PLO defenders put up strong resistance and sometimes used civilians as human shields. It took four days of combat to secure Rashidiya and three days to secure the other three camps. At the same time, an Israeli amphibious operation was conducted north of Sidon, beginning with a diversionary bombardment of targets away from the landing zone by missile boats and aircraft. Two groups of commandos from the Shayetet 13 naval commando unit then came ashore to probe enemy defenses and secure the landing site, one of which swam to the mouth of the Awali River and another which came ashore on the landing beach in rubber dinghies. 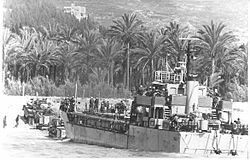 After a brief gunbattle with armed Palestinians, the main landings began, with paratroopers coming ashore in rubber dinghies to establish a beachhead followed by three landing craft that unloaded troops and armor. Over the following days, the three landing ships would run between Israel and Lebanon, shuttling more troops and armor onto the beachhead. The PLO response was limited to ineffective mortar fire, while Israeli missile boats and aircraft attacked Palestinian positions in response, and in total, about 2,400 soldiers and 400 tanks and armored personnel carriers were landed. From the beach, these forces advanced on Sidon, supported by naval gunfire from missile boats. At the same time, Israeli forces in the central sector advanced towards Jezzine while those in the eastern sector remained in place, but began setting up heavy artillery positions that put Syrian SAM units in artillery range. Meanwhile, Israeli forces advancing along the coastal road reached the outskirts of Sidon, but were delayed by heavy resistance in the main streets and the Ain al-Hilweh refugee camp on the southeastern edge of the city, and after an attempt by paratroopers to capture the city center and secure the south-north route through the city failed, the city was bypassed via a detour through the hills to the east. After linking up with the forces that had landed north of Sidon, while another force of paratroopers and armor with heavy air and artillery support advanced through central Sidon and cleared a south-north route through the city in fierce fighting. Another Israeli division passed through the city to link up with the forces north of Sidon. In the center, most Israeli forces advancing towards Jezzine bypassed the town to continue advancing towards the main highway in the area, leaving a blocking force in the area that was soon joined by an armored brigade. Fighting broke out in Jezzine between the Israelis and Syrian forces holding the town. In the Battle of Jezzine, Israeli forces consisting of two tank battalions supported by a reconnaissance company and engineering platoon took Jezzine in a fierce daylong battle against a Syrian battalion, then repulsed a fierce counterattack by dozens of Syrian commandos during the night in combat that lasted until dawn. Meanwhile, Israeli forces continued to advance along the Syrians' right flank. Israeli forces advancing along the coast also completed the capture of Sidon. Paratroopers attacked the Kasbah while a combined force of Golani Brigade infantry and tanks attacked Ain al-Hilweh. The Kasbah was secured in three days; the paratroopers advanced cautiously and managed to take it without suffering any casualties. However, the fighting at Ain al-Hilweh was to prove some of the fiercest of the entire war. The camp was heavily fortified and defended by PLO fighters and Islamic fundamentalists. The defenders fought fiercely over every alley and house, with civilians who wanted to surrender shot by the fundamentalists. The Israeli advance was slow and was supported by massive air and artillery bombardment. The IDF employed its previous tactics of urging civilians to leave with loudspeakers before attacking an area. It took about eight days for the camp to fall, with the battle culminating in a last stand by the defenders at the camp mosque, which was blown up by the IDF. In the east, Israeli forces advanced along four main routes towards Joub Jannine, along both sides of the Qaraoun reservoir. The Syrians resisted fiercely. Syrian infantrymen armed with anti-tank weapons staged ambushes against Israeli tanks, and Syrian Gazelle helicopters armed with HOT missiles proved effective against Israeli armor. However, the Israelis managed to capture the valley floor, and the Syrians retreated. The Israelis captured Rachaiya, advanced through Kfar Quoq, and took the outskirts of Yanta. Joub Jannine also fell to the Israelis. The extent of Israeli advances ensured that Syrian reinforcements were blocked from deploying west of the Qaraoun reservoir. An Israeli armored battalion then probed past Joub Jannine to the town of Sultan Yacoub, and was ambushed by Syrian forces lying in wait. In the Battle of Sultan Yacoub, the Israelis fought fiercely to extricate themselves, and called in reinforcements and artillery fire to cover the withdrawal. After six hours, the Israelis managed to retreat. 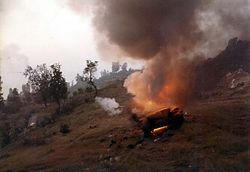 In addition, another major air battle erupted in which the Israeli Air Force shot down 25 Syrian jets and 4 helicopters. A destroyed airliner at Beirut Airport, 1982. To the west, as IDF troops mopped up remaining resistance in Tyre and Sidon, the Israeli advance on Beirut continued, and Syrian tank and commando units were then deployed south of Beirut to reinforce the PLO. When the Israelis reached the Beirut suburb of Kafr Sill, they met a joint Syrian-PLO force for the first time, and fought a difficult battle to take it. The IDF temporarily halted its advance in the western sector at Kafr Sill. IAF Roundel for the strike aircraft that attacked Syrian SAM batteries in 1982 Lebanon war. On 22 June, the IDF launched an operation to capture the highway. The Israeli Air Force flew highly effective missions against Syrian positions and vehicles, with Israeli pilots reporting 130 enemy vehicles destroyed in a single air attack alone. Israeli long-range artillery targeted Syrian strongpoints to the north. Israeli armored forces with artillery support attacked Syrian positions along the highway, with the objective of driving them from the highway all the way back to the edge of the Bekaa Valley. With air and artillery support mostly limited to targets north of the highway, the fighting was fierce, especially to the south. By the end of the day, Israel accepted an American request for a cease-fire and halted its offensive, but the cease-fire collapsed the following day and the fighting resumed. As the Israelis pushed forward, and managed to trap a large Syrian force, Syrian defenses began to collapse. For the first time in the war, Syrian troops began to break and run. At Aley, which was defended by Iranian volunteers sent to fight for the PLO, the Israelis encountered fierce resistance. The Israeli Navy missile boat INS Romach off the coast of Lebanon, August 1982. The Israelis managed to push to the eastern Bekaa Valley, and on 24 June, began to shell the outskirts of Chtaura, which was at the northern mouth of the Bekaa Valley and served as headquarters of all Syrian forces there. It was also the last major obstacle before the Syrian border, as well as Syria's capital Damascus itself. The Israelis managed to reach the mountain pass near the village of Dahr el-Baidar, which was the last obstacle before Cthaura. The Syrians fought fiercely to hold the pass, and the Israeli advance halted, with the Israelis holding their ground and harassing the Syrians with artillery fire. By 25 June, with the remaining Syrian positions on and north of the highway no longer tenable, the Syrians withdrew. The Israelis allowed the withdrawal to occur but conducted artillery harassment and continued to shell the outskirts of Chtaura. The Syrians attempted to deploy a SAM battery in the Bekaa Valley at midnight, but Israeli intelligence detected this, and the battery was destroyed in an Israeli air attack. By the end of the day, a cease-fire was announced. The Israelis stopped at their present positions. An aerial view of the stadium used as an ammunition supply site for the PLO, after Israeli airstrikes in 1982. Siege of Beirut had begun on 14 June: Israeli forces had completed the encirclement of the city the previous day. The Israelis chose to keep the city under siege rather than forcibly capture it, as they were unwilling to accept the heavy casualties that the heavy street fighting required to capture the city would have resulted in. Israeli forces bombarded targets within Beirut from land, sea, and air, and attempted to assassinate Palestinian leaders through airstrikes. The siege lasted until August, when an agreement was reached in August 1982. More than 14,000 PLO combatants evacuated the country in August and September, supervised by the Multinational Force in Lebanon, an international peacekeeping force with troops from the United States, United Kingdom, France, and Italy. About 6,500 Fatah fighters relocated from Beirut to Jordan, Syria, Iraq, Sudan, both North and South Yemen, Greece, and Tunisia—the latter of which became the new PLO headquarters. Philip Habib, Ronald Reagan's envoy to Lebanon, provided an understanding (i.e., assurance) to the PLO that the Palestinian civilians in the refugee camps would not be harmed. However, increased hostilities against the US resulted in the April 1983 United States Embassy bombing. In response, the US brokered the May 17 Agreement, in an attempt to stall hostilities between Israel and Lebanon. However, this agreement eventually failed to take shape, and hostilities continued. These attacks were attributed to Iranian-backed Islamist guerrillas. Following this incident, international peacekeeping forces were withdrawn from Lebanon. 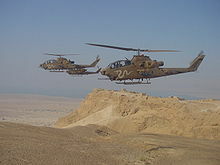 During the course of combat operations, the Israeli Air Force conducted successful ground attack missions against Syrian and PLO targets, with Israeli attack helicopters inflicting heavy losses on Syrian armor. Israeli jets shot down between 82 and 86 Syrian aircraft in aerial combat, without losses. A single Israeli A-4 Skyhawk and two helicopters were shot down by anti-aircraft fire and SAM missiles. This was the largest aerial combat battle of the jet age with over 150 fighters from both sides engaged. Syrian claims of aerial victories were met with skepticism even from their Soviet allies. The Soviets were so shaken by the staggering losses sustained by their allies that they dispatched the deputy head of their air defense force to Syria to examine how the Israelis had been so dominant. The Israeli Air Force also performed ground attacks, notably destroying the majority of Syrian anti-aircraft batteries stationed in Lebanon. AH-1 Cobra helicopter gunships were employed against Syrian armour and fortifications. IAF Cobras destroyed dozens of Syrian Armored fighting vehicles, including some of the modern Soviet T-72 main battle tanks. The war also witnessed the Israeli Merkava MBT make its first combat debut, squaring off against Syrian T-72 tanks. 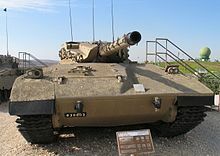 During these engagements, the Israelis claimed that the Merkava proved superior to the T-72, destroying a number of them without sustaining a single loss to T-72 fire. Former IAF commander, David Ivri would later recall a meeting with a high-ranking member of the Warsaw Pact, in which he was told that the dominance of Israeli and U.S. technology and tactics during the war was one of the factors that changed Soviet mind-set, leading to Glasnost and ultimately, the fall of the Soviet Union. However, defense analysts and the Syrians claimed the opposite, saying that their T-72s were highly effective and that none were lost. The T-72 tanks of the Syrian 2nd Armored Division were credited with not only halting the advance of an Israeli armored brigade on Rashaya on 10 June but pushing them back. They tallied the destruction of 33 tanks and the capture of an M60 Patton, which was sent to Damascus and thence transported to Moscow. Syrian tanks saw similar success against Israeli armor in Ain Zhalta and Sultan Yacoub in fighting on 8–10 June, stemming their advance to capture the Beirut-Damascus highway. On 14 September 1982, Bachir Gemayel, the newly elected President of Lebanon, was assassinated by Habib Shartouni of the Syrian Social Nationalist Party. Israeli forces occupied West Beirut the next day. At that time, the Lebanese Christian Militia, also known as the Phalangists, were allied with Israel. The Israeli command authorized the entrance of a force of approximately 150 Phalangist fighters' into Sabra and the Shatila refugee camp. Shatila had previously been one of the PLO's three main training camps for foreign militants and the main training camp for European militants; the Israelis maintained that 2,000 to 3,000 terrorists remained in the camps, but were unwilling to risk the lives of more of their soldiers after the Lebanese army repeatedly refused to "clear them out." Between 460 and 3,500 civilians, mostly Palestinians and Lebanese Shiites were massacred by the Phalangists, who themselves suffered only two casualties. The Lebanese army's chief prosecutor investigated the killings and counted 460 dead, Israeli intelligence estimated 700–800 dead, and the Palestinian Red Crescent claimed 2,000 dead. 1,200 death certificates were issued to anyone who produced three witnesses claiming a family member disappeared during the time of the massacre. Nearly all of the victims were men. Israeli troops surrounded the camps with tanks and checkpoints, monitoring entrances and exits. Further, Israeli investigation by the Kahan Commission of Inquiry found that Ariel Sharon bore "personal responsibility" for failing to prevent the massacre, and for failing to act once he learned of the massacre. The Commission recommended that he be removed as Defense Minister and that he never hold a position in any future Israeli government. Sharon initially ignored the call to resign, but after the death of an anti-war protester, resigned as Israel's Defense Minister, remaining in Begin's cabinet as a Minister without portfolio. The 1982 Lebanon War was at first a conventional war up to and including when the PLO were expelled from Beirut. The war was limited by both Israel and Syria because they were determined to isolate the fighting, not allowing it to turn into an all-out war. Israeli forces were numerically superior, allowing Israel to maintain both the initiative and an element of surprise. The Syrian Army fielded six divisions and 500 aircraft, while Israel used five divisions and two brigades, plus 600 aircraft. There were numerous other factions involved. Coastal Sector, (from Rosh Hanikra north to Tyre, Sidon, Damour and Beirut.) – Forces included Division 91 with three brigades including the 211th and the Golani Brigade. The 35 Paratroop Brigade and the Na'hal 50th Paratroop Battalion were attached to the division as needed. The Israeli Navy provided naval interdiction, shore gunfire support and landed a mixed brigade from Division 96 at the mouth of the Awali River near Sidon. Israeli Naval commandos had landed there previously. 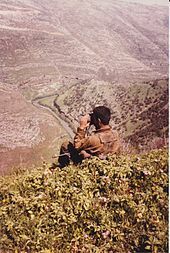 Eastern Sector (from Rachaiya and Hasbaiya through the Bekaa Valley around Lake Qaraoun) – IDF forces included Divisions 90 and 252, the Vardi Force and the Special Maneuver Force which was composed of two brigades of Infantry and paratroops who were trained for anti-tank operations. These forces were primarily used to contain the Syrians with orders not to initiate combat against them. Syrian anti-tank teams deployed French-made Milan ATGMs during the war in Lebanon in 1982. A Lebanese national army unit of 1,350 was under the operational control of the UNIFIL commander, HQ located at Arzun with sub-units attached to UNIFIL Battalions. Lebanese Navy: The mostly Christian manned force operated several patrol boats and was loyal to the government. It played little or no part in the war. Lebanese Air Force: This largely Christian force operated a force of jet fighters, helicopters and other aircraft and it too played little part in the war. Internal Security Forces: the national police and internal security force of Lebanon. Guardians of the Cedars, exclusively Maronite with strong anti-Syrian views, 3,000–6,000 uniformed militiamen armed with modern small-arms. They were backed by a mechanized force consisting of a single M50 Super Sherman medium tank, a few M113 armored personnel carriers, M42 Dusters and Chaimite V200 armoured cars backed by gun-trucks (Land-Rovers, Toyota Land Cruisers, GMC and Ford light pick-ups, plus US M35A2 2-1/2 ton cargo trucks) fitted with heavy machine guns (HMGs), recoilless rifles, and a few anti-aircraft autocannons. The Druze were initially neutral but turned against the LF when the new government attempted to force their way into Druze controlled territory in the Chouf region. The People's Liberation Army – PLA (Arabic: Jayish al-Tahrir al-Sha'aby) or Armée de Libération Populaire (ALP), the militia of the Druze Progressive Socialist Party, consisted of 10,000 to 20,000 men and boys. The Al-Mourabitoun (Guardians or Saviours in Arabic) is a primarily Druze (at that time) secular, non-sectarian movement, its membership has always been overwhelmingly Muslim, being perceived within Lebanon as a predominantly Sunni organization. Its militia (Mouqatin or Fighters) numbered several thousand men and were known for wearing red painted Soviet helmets with Mourabitoun painted on front in Arabic script. 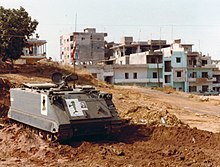 The Mourabitoun fought alongside the PLO in the Beirut area until the cease fire after which they acquired much cast-off PLO equipment such as tanks and rocket launchers. They were supported largely by Libya and Syria. Richard Gabriel estimated that roughly 2,400 PLO fighters were killed during the war, of whom about 1,400 were killed throughout southern Lebanon and another 1,000 killed during the Siege of Beirut. Gabriel also estimated that between 5,000 and 8,000 civilians died during the war. Some later estimates have put the total figure at 18–19,000 killed and more than 30,000 wounded, most of them civilians. 80% of villages in South Lebanon were damaged, with some completely destroyed. The Israeli government maintained that about 1,000 Palestinian fighters and 800 Lebanese civilians died during the invasion, excluding the siege of Beirut. Kenneth Pollack estimated that 1,200 Syrian soldiers were killed and about 3,000 wounded during the war. Heavy Israeli casualties, alleged disinformation of Israeli government leaders and the Israeli public by Israeli military, as well as political advocates of the campaign and lack of clear goals led to increasing disquiet among Israelis. This culminated in a large protest rally in Tel Aviv on 25 September 1982, organized by the Peace Now movement, following the 1982 Sabra and Shatila massacre. Organizers claimed 400,000 people participated in the rally, and it became known as the "400,000 rally". Other estimates put the figure much lower, maybe reaching 100,000 Israelis but including thousands of reserve soldiers back from Lebanon. According to Abraham Rabinovich, the complete dominance of U.S. and Israeli technology and tactics over those of the Eastern Bloc was to have been a factor that hastened the demise of the Warsaw Pact and Soviet Union. [dubious – discuss] However, this was not the first confrontation in which Soviet weaponry had been outmatched by American weaponry. In many of the Cold War conflicts[which?] the Americans and their allies had superior technology. Nonetheless, the gap between the First World and Second World weaponry was more apparent in the 1980s and weighed more heavily on Second World leaders. On 16 December 1982, the United Nations General Assembly condemned the Sabra and Shatila massacre and declared it to be an act of genocide. The voting record on section D of Resolution 37/123, which "resolves that the massacre was an act of genocide", was: yes: 123; no: 0; abstentions: 22; non-voting: 12. The abstentions were: Belgium, Denmark, France, Germany (Federal Republic), Iceland, Ireland, Italy, Luxembourg, the Netherlands, Norway, Portugal, Sweden, United Kingdom, U.S., Canada, Australia, New Zealand, Israel, Ivory Coast, Papua New Guinea, Barbados and Dominican Republic. Some delegates disputed the claim that the massacre constituted genocide. ^ a b "In the Spotlight: PKK (A.k.a KADEK) Kurdish Worker's Party". Cdi.org. Archived from the original on 13 August 2011. Retrieved 29 February 2012. ^ a b "Abdullah Öcalan en de ontwikkeling van de PKK". Xs4all.nl. Archived from the original on 15 December 2010. Retrieved 29 February 2012. ^ a b "a secret relationship". Niqash.org. Archived from the original on 14 March 2012. Retrieved 29 February 2012. ^ Eligar Sadeh Militarization and State Power in the Arab-Israeli Conflict: Case Study of Israel, 1948–1982, Universal-Publishers, 1997 p.119. ^ Mira M. Sucharov, The International Self: Psychoanalysis and the Search for Israeli-Palestinian Peace, SUNY Press, 2012 p.95:'Gioven the widely perceived strategic failure of the war'. ^ http://mfa.gov.il/MFA/AboutIsrael/History/Pages/The%20Arab-Israeli%20Wars.aspx – "In retaliation, the IDF attacked Lebanon once again and succeeded in its original purpose to wipe out terrorist bases in the south of Lebanon. A series of simultaneous, amphibious operations was remarkably successful. Subsequently, however, the mission was enlarged and the capture of Beirut signalled the transition to a long drawn-out war. It failed to achieve its ultimate purpose. A peace treaty with Lebanon was signed, but not ratified; the Christian government of fragmented Lebanon was too weak to prevail." ^ Israel Ministry of Foreign Affairs; Netanel Lorch (2013). "The Lebanon War: Operation Peace for Galilee (1982)". The Israel Ministry of Foreign Affairs. The failure of Operation Peace of Galilee to achieve its objective prevailed upon the new national coalition government, which took office in 1984, to withdraw forthwith from Lebanon. The third goal was to remove Syrian presence from Lebanon. The recognition that this goal was obviously unsuccessful must betempered by an awareness of the Lebanese situation since 1982. Even when the first two aims seemed to have been met, Syrian recalcitrance acted as a stumbling blocks the Syrians would by nomeans agree to a withdrawal from Lebanon in conjunction with the Israelis and therefore were able to effectively scuttle the 17 May, Agreement between Israel and Lebanon before it had any chance of fulfillment; Syria offered a haven for PLO fighters in the Bekaa Valley from which they could stage raids on the IDF in Lebanon and from which many have now moved back into Beirut and Sidon; and despite having taken severe losses during the June fighting, Syria was able to quickly replace those losses with better Soviet equipment accompanied by a number of Soviet advisors. ^ Hirst, David (2010). Beware of Small States. NationBooks. pp. 144–145. ISBN 978-1-56858-657-1. In time, however, Arafat and his guerrilla leadership decided that they would have to withdraw, leaving no military and very little political or symbolic presence behind. Their enemy's firepower and overall strategic advantage were too great and it was apparently ready to use them to destroy the whole city over the heads of its inhabitants. The rank and file did not like this decision, and there were murmurings of 'treason' from some of Arafat's harsher critics. Had they not already held out, far longer than any Arab country in any former war, against all that the most powerful army in the Middle East – and the fourth most powerful in the world, according to Sharon – could throw against them? (...) But [Palestinians] knew that, if they expected too much, they could easily lose [Lebanense Muslim support] again. 'If this had been Jerusalem', they said, 'we would have stayed to the end. But Beirut is not outs to destroy. ^ a b "Lebanon Demands Payment". The Los Angeles Times. 16 November 1984. ^ "ISRAELI GENERAL SAYS MISSION IS TO SMASH P.L.O. IN BEIRUT". The New York Times. 15 June 1982. Retrieved 1 May 2017. ^ Tucker, Spencer C.; Roberts, Priscilla (2008). The Encyclopedia of the Arab-Israeli Conflict. A Political, Social, and Military. ABC-CLIO. p. 623. ISBN 9781851098415. ^ Bickerton, Ian J. (2009). The Arab-Israeli Conflict: A History. Bloomsbury Publishing. p. 151. ISBN 9781861895271. ^ Martin, Gus (2013). Understanding Terrorism: Challenges, Perspectives, and Issues. Sage Publications. ISBN 9781452205823. The operation was called Operation Peace for Galilee and was launched in reply to ongoing PLO attacks from its Lebanese bases. ^ Kissinger, Henry (1999). Years of Renewal, Phoenix Press. ISBN 1-84212-042-5. p. 1022. "I think with sadness of these civilized men who in a turbulent part of the world had fashioned a democratic society based on genuine mutual respect of religion. Their achievement did not survive. The passions sweeping the area were too powerful to be contained by subtle constitutional arrangements. As it had attempted in Jordan, the Palestinian movement wrecked the delicate balance of Lebanon's stability. Before the peace process could run its course, Lebanon was torn apart. Over its prostrate body of writing all the factions and forces of the Middle East still chase their eternal dreams and act out their perennial nightmares." ^ "Extracts relating to Article 98 of the Charter of the United Nations: Supplement No 5 (1970–1978)" (PDF). Repertory of Practice of United Nations Organs. United Nations. pp. §275. Archived from the original (PDF) on 19 October 2013. Retrieved 6 August 2006. ^ "UN Security Council report S/14295" (PDF). UN.org. Archived from the original (PDF) on 20 October 2014. Retrieved 1 May 2017. ^ "United Nations Security Council document S/14537". UN.org. Retrieved 1 May 2017. ^ a b "United Nations Security Council document S/14789". UN.org. Retrieved 1 May 2017. ^ "The Israeli Air Force". IAF.org.il. Retrieved 1 May 2017. ^ Friedman, Thomas L. "Israeli Jets Raid P.L.O. in Lebanon; Shelling follows". The New York Times, 10 May 1982, p. 1. ^ UN Doc S/PV.2292 Archived 12 March 2006 at the Wayback Machine, 17 July 1981. ^ "Sharon's war crimes in Lebanon: the record". Wsws.org. 22 February 2002. Retrieved 29 February 2012. ^ Siklaw, Rami (Winter 2012). "The Dynamics of the Amal Movement in Lebanon 1975–90". Arab Studies Quarterly. 34 (1): 4–26. ^ Ball, George W. Error and Betrayal in Lebanon, p. 35. ^ Lee, Timothy. "The stupidity of Ronald Reagan. – Slate Magazine". Slate.com. Retrieved 29 February 2012. ^ "Alexander Haig". Time. New York. 9 April 1984. Archived from the original on 28 April 2011. Retrieved 6 April 2011. ^ Blight, James G.; et al. (2012). Becoming Enemies: U.S.-Iran Relations and the Iran-Iraq War, 1979–1988. Rowman & Littlefield Publishers. pp. 19, 110–111. ISBN 978-1-4422-0830-8. ^ Yevgeny Primakov, Russia and the Arabs: Behind the Scenes in the Middle East from the Cold War to the Present, Basic Books 2009 p.201. ^ Blight, James G.; et al. (2012). Becoming Enemies: U.S.-Iran Relations and the Iran-Iraq War, 1979–1988. Rowman & Littlefield Publishers. p. 104. ISBN 978-1-4422-0830-8. ^ Joffe, Lawrence (25 February 2003). "Obituary of Shlomo Argov". The Guardian. Retrieved 31 May 2012. At last, the then Israeli defence minister Ariel Sharon had a pretext for his long-planned campaign to eliminate the Palestine Liberation Organisation (PLO) and its headquarters in the Lebanese capital, Beirut. In his memoirs, Sharon admits that the Dorchester ambush was "merely the spark that lit the fuse". ^ Schiff & Ya'ari 1984, pp. 97, 99–100. ^ Gerald Cromer, A War of Words: Political Violence and Public Debate in Israel, Frank Cass 2004 p.116. ^ גלעד בארי, מלחמת לבנון – נגד פלסטין הקטנה Gil'ad Be'eri, "The Lebanon War" – "Confronting "Little Palestine" in Lebanon"
^ "1982: PLO leader forced from Beirut". BBC News. 30 August 1982. Retrieved 20 April 2010. ^ Ilyin, Vladimir; Nikolski, Mikhail (1997). "Sovremennye tanki v boiu" [Modern Tanks in Battle]. Tekhnika i vooruzhenie [Machinery and Armament] (in Russian) (1). ^ a b "Flashback: Sabra and Shatila massacres", BBC News Online (London), 24 January 2002. ^ a b c Schiff, Ze'ev; Ya'ari, Ehud (1985). Israel's Lebanon War. Simon and Schuster. p. 282. ISBN 978-0-671-60216-1. ^ a b Becker, Jillian (1984). PLO: The Rise and Fall of the Palestine Liberation Organization. AuthorHouse. p. 265. ISBN 978-1-4918-4435-9. ^ a b c "APPENDIX B – Lebanon, APPENDIX B – Lebanon". Lcweb2.loc.gov. Retrieved 29 February 2012. ^ "About this Collection – Country Studies". LOC.gov. Retrieved 1 May 2017. ^ "Lebanon. The Two-Week War. Section 1 of 1; Data as of December 1987 Library of Congress Country Studies". Lcweb2.loc.gov. 3 June 1982. Retrieved 29 February 2012. ^ "The Lebanon War". Jewishvirtuallibrary.org. Retrieved 29 February 2012. ^ "– An ex-ISF V-200 Chaimite employed by the Guardians of the Cedar pictured at Houche-el-Oumara during the Battle for Zahle, April–June 1981". Milinme.wordpress.com. Retrieved 29 February 2012. ^ "– GoC M34 gun-truck with ZU-23-2 AA autocannon, c.1976". Alsminiature.com. Retrieved 29 February 2012. ^ a b "Lebanon". Lcweb2.loc.gov. Retrieved 29 February 2012. ^ Shahid, Leila (Autumn 2002). "The Sabra and Shatila Massacres: Eye-Witness Reports" (PDF). Journal of Palestine Studies. 32 (1): 36–58. doi:10.1525/jps.2002.32.1.36. Archived from the original (PDF) on 22 May 2013. ^ "Who are Hezbollah". BBC News. 21 May 2008. Retrieved 30 January 2017. ^ "Extracts relating to Article 98 of the Charter of the United Nations: Supplement No 6 (1979–1984)" (PDF). Repertory of Practice of United Nations Organs. United Nations. pp. §185–§199. Archived from the original (PDF) on 19 October 2013. Retrieved 6 August 2006. ^ Spencer C. Tucker (8 October 2010). The Encyclopedia of Middle East Wars: The United States in the Persian Gulf, Afghanistan, and Iraq Conflicts [5 volumes]: The United States in the Persian Gulf, Afghanistan, and Iraq Conflicts. 2. ABC-CLIO. p. 732. ISBN 978-1-85109-948-1. ^ Molly Dunigan (28 February 2011). Victory for Hire: Private Security Companies' Impact on Military Effectiveness. Stanford University Press. pp. 103–. ISBN 978-0-8047-7459-8. ^ Shipler, David K. (14 July 1982). "Toll of Lebanon Dead and Injured Is Still Uncertain in Chaos of War". The New York Times. ^ "Mid-Range Wars and Atrocities of the Twentieth Century". Retrieved 4 August 2013. ^ David Waines (1 October 2004). An Introduction To Islam. Cambridge University Press India Pvt. Limited. p. 285. ISBN 978-81-7596-189-0. ^ "Casualties Of Mideast Wars". Los Angeles Times. Associated Press. 8 March 1991. Retrieved 1 October 2014. ^ Jack Donnelly; Rhoda E. Howard-Hassmann (1 January 1987). International Handbook of Human Rights. ABC-CLIO. pp. 247–. ISBN 978-0-313-24788-0. ^ Walsh, Edward (16 November 1984). "Lebanon, Israel Resume Talks on Troop Pullout". The Washington Post. ^ Luft, Gal (1 September 2000). "Israel's Security Zone in Lebanon – A Tragedy?". MEForum.org. Retrieved 1 May 2017. ^ American Jewish Committee Archives American Jewish Yearbook 1985. p. 126. ^ American Jewish Committee Archives American Jewish Yearbook 1985. p. 130. ^ American Jewish Committee Archives, American Jewish Yearbook 1985. p. 260. ^ Warschawski, Michel (April–May 2006). "Inside the Anti-Occupation Camp" Archived 27 June 2006 at the Wayback Machine, The Link (Americans for Middle East Understanding). ^ Dagher, Carole (2002). Bring Down the Walls: Lebanon's Post-War Challenge. Palgrave Macmillan. p. 71. ISBN 978-0312293369. ^ "Who are Hezbollah?". BBC News. Retrieved 1 May 2017. ^ "Security Council Endorses Secretary-General's Conclusion On Israeli Withdrawal From Lebanon as of 16 June", UN Press release SC/6878, 18 June 2000. ^ "Security Council Press Release SC/8372". United Nations. 29 April 2005. Retrieved 29 February 2012. ^ Netanel Lorch. "The Arab-Israeli Wars". Israel Ministry of Foreign Affairs. Archived from the original on 29 April 2011. Retrieved 6 April 2011. ^ "E/CN.4/2000/22/Add.1 of 3 March 2000". United Nations. Archived from the original on 23 December 2011. Retrieved 29 February 2012. ^ Arak, Joel (29 October 2004). "Osama Bin Laden Warns America: Terror Leader Admits For First Time That He Ordered 9/11 Attacks", CBS News. ^ Leo Kuper, "Theoretical Issues Relating to Genocide: Uses and Abuses", in George J. Andreopoulos, Genocide: Conceptual and Historical Dimensions, University of Pennsylvania Press, 1997, ISBN 0-8122-1616-4, p. 37. ^ Schabas, William (2009). Genocide in International Law: The Crime of Crimes. Cambridge University Press. p. 455. ISBN 978-0521719001. ^ a b MacBride, Seán; Asmal, A. K.; Bercusson, B.; Falk, R. A.; de la Pradelle, G.; Wild, S. (1983). Israel in Lebanon: The Report of International Commission to enquire into reported violations of International Law by Israel during its invasion of the Lebanon. London: Ithaca Press. p. 191. ISBN 0-903729-96-2. Chomsky, Noam (1983). The Fateful Triangle: the United States, Israel and the Palestinians. South End Press. ISBN 0-89608-187-7. Cobban, H. (1984). The Palestinian Liberation Organization: People, Power and Politics. Cambridge: Cambridge University Press. ISBN 0-521-27216-5. Fisk, Robert (2001). Pity the Nation: Lebanon at War. Oxford University Press. ISBN 978-0-19-280130-2. Friedman, Thomas (2006). From Beirut to Jerusalem. New York: Anchor Books. ISBN 0-385-41372-6. Herzog, Chaim; Gazit, Shlomo (2005). The Arab-Israeli Wars: War and Peace in the Middle East. Vintage Books. p. 560. ISBN 1-4000-7963-2. Maoz, Zeev (2006). Defending the Holy Land: A Critical Analysis of Israel's Security and Foreign Policy. Ann Arbor: The University of Michigan Press. ISBN 978-0-472-115402. Morris, Benny (1999). Righteous Victims. Alfred A. Knopf, New York. p. 768. ISBN 0-679-42120-3. Rabinovich, Abraham (2004). The Yom Kippur War: The Epic Encounter That Transformed the Middle East. Schocken Books. ISBN 978-0805211245. Reagan, Ronald (2007). Douglas Brinkley (ed.). The Reagan Diaries. Harper Collins. ISBN 978-0-06-087600-5. Sayigh, Y. (1999). Armed Struggle and the Search for State: The Palestinian National Movement, 1949–1993. Oxford: Oxford University Press. ISBN 0-19-829643-6. Schiff, Ze'ev; Ya'ari, Ehud (1984). Israel's Lebanon War. New York, NY: Simon & Schuster. ISBN 0-671-47991-1. Seale, Patrick (1989). Asad: The Struggle for Syria. University of California Press. ISBN 0-520-06667-7. Shlaim, Avi (1999). The Iron Wall: Israel and the Arab world. Norton. ISBN 0-393-04816-0. Shlaim, Avi (2007). Lion of Jordan; The life of King Hussein in War and Peace. Allen Lane. ISBN 978-0-7139-9777-4. Bryce Walker & the editors of Time-Life books (1983). Fighting Jets: The Epic of Flight. Time Life Books. ISBN 978-0809433629. Barzilai, Gad (1996). Wars, Internal Conflicts, and Political Order: A Jewish Democracy in the Middle East. New York University Press. ISBN 978-0-7914-2944-0. Brzoska, M.; Pearson, F. S. (1994). Arms and Warfare: Escalation, De-Escalation, and Negotiation. University of South Carolina Press. ISBN 0-87249-982-0. Gilbert, Martin (1998). Israel: A History. London: Black Swan. ISBN 0-688-12362-7. Harkabi, Y. (1989). Israel's Fateful Hour. New York, NY: Harper & Row. ISBN 0-06-091613-3. Penslar, Derek J. (2007). Israel in History; The Jewish state in comparative perspective. Routledge. ISBN 0-415-40036-8. 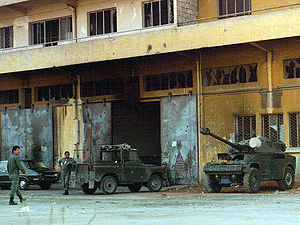 Wikimedia Commons has media related to 1982 Lebanon War.